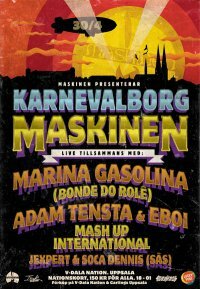 I just bought tickets yesterday for Karnevalborg on April 30th at my old nation of V-Dala. This concert is going to be legit with some of my favorite Swedish artists headlining – including Adam Tensta & Eboi and Maskinen. While on the topic, I thought I would post some of these artists’ work as well as a few other popular Swedish musicians. It is just me or do the Swedes do a way better job making music videos? Lykke Li always has crazy-good videos; check this one out too. Also, there’s a remixed version of ‘Little Bit’ with Drake that you can listen to here. Drake also remixes Peter Bjorn and John’s ‘Let’s Call It Off’ that you can hear here. Wale has a remix to ‘Nothing To Worry About’ that you can listen to here. I’ve heard of Sophia Somajo before because she was in ‘Before U Know It’ with Adam Tensta. I also think she was on the cover of a magazine I saw in Uppsala because she was performing there. I put this up previously in this post, but here is Adam Tensta feat. Sophia Somajo’s song ‘Before U Know It’ again. I really like this video… especially since he’s wearing that hat from The Hundreds. I also talked about Adam Tensta and Maskinen here.